Got Your Nyjer Feeder Ready? 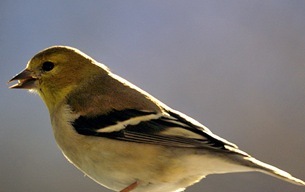 Goldfinches are back in droves.. but they’re not quite so gold yet. Still sporting drab winter plumage, it’s not until late spring/early summer when they’ll molt again. It’s the process of shedding old worn feathers to make way for new ones, and goldfinches happen to be one of very few birds who molt twice per year. 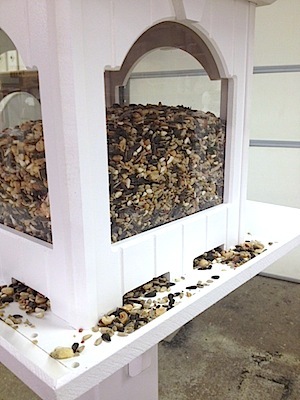 If your nyjer feeder has been sitting for a while sans activity, the older seed may be moldy, and finches won’t eat it. 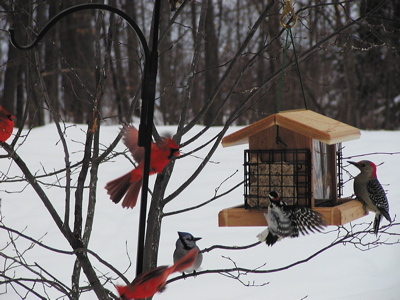 Consider trashing that old seed, giving the feeder a good cleaning and refilling with fresh goods. Doing this provides a welcome sign for these cool little birds. One of the larger capacity feeders is shown here – holding 5+ lbs. of seed. 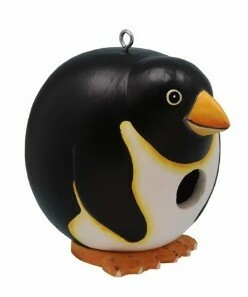 A relative of the Rainbow Finch Feeder, the Super version is even better for large finch crowds. With colorful perches and a great design, this nyjer feeder lets you fill from both the top and bottom. This eliminates stale seed piling up at the bottom. By alternating which end is filled with fresh seed, there’s never a build-up of old stuff. There’s another bird out there now who might easily be confused with the goldfinch. 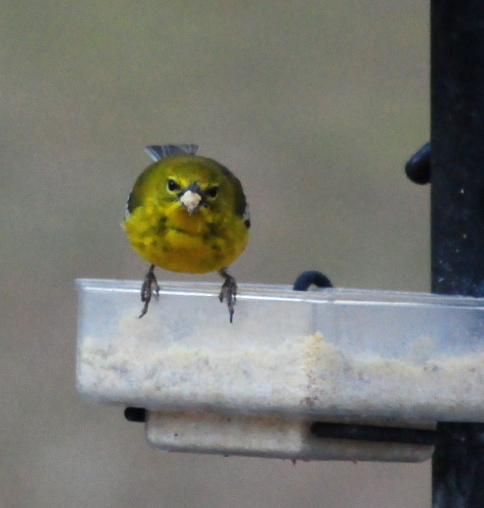 About the same size, but very opposite behavior, warblers can be pretty territorial around bird feeders. Males will fight and fend off others, doing this sort of vertical flight dance where the birds look almost intertwined. Goldfinches on the other hand would rather find another feeder than fight. This is when an extra thistle sock or two come in very handy. Inexpensive and simple to use, they offer extra feeding spots during goldfinches’ busy breeding season. Oh and this warbler… he’s got a mouthful of suet and a big attitude too! To roll out the welcome mat for finches and other songbirds, offer a consistent fresh water source and keep bird feeders clean. 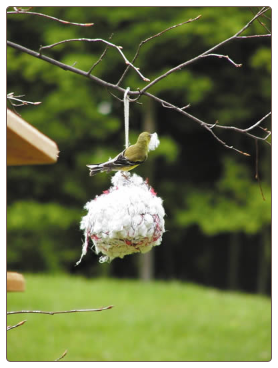 Adding some nesting materials in early spring will also encourage residency at your place! In honor of a belated Squirrel Appreciation Day, which was actually January 21st (yes the critters do have a day named for them) we wanted to show the absolute easiest feeder ever. You needn’t buy anything, as this item’s usually a staple in your pantry. Peanut butter… because they love it! And with this crazy frigid weather, the high fat & protein gives them extra calories to stay warm. Calories=Energy. So what do ya do with the peanut butter? Slap it on a tree trunk! Just smear some on a tree and the entertainment is free. 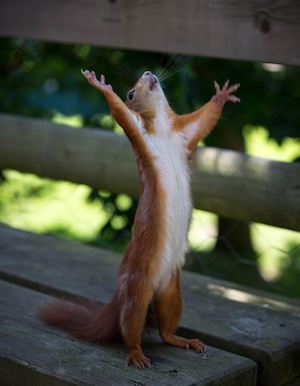 Why are there no squirrels in the picture then? It’s been so cold overnight, we’re not even seeing them venture out bed until noon! 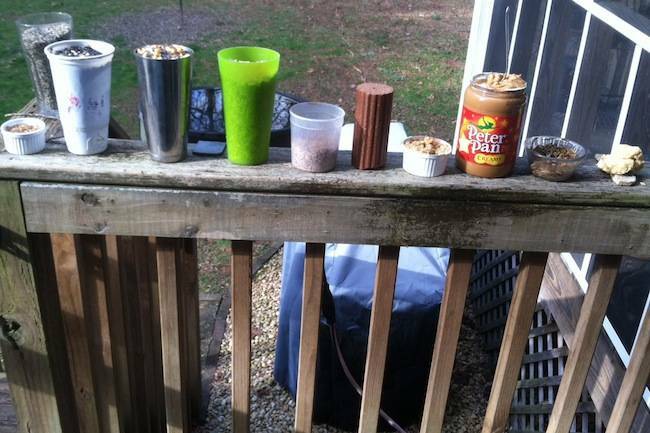 We’ll use peanut butter on other squirrel feeders during freezing weather too. Smeared on corn cobs, or long-lasting corn logs (compressed corn), it’s simple to do for a special treat. And squirrels aren’t the only ones who love the gooey stuff! 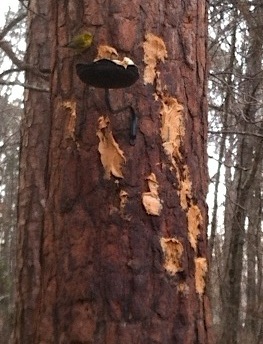 Woodpeckers, nuthatches and the warbler shown here seem to like peanut butter too, in freezing weather anyway. Is it safe for birds? Absolutely, because it’s one of the base ingredients in many suet recipes. The black iron thing in the picture is really a wall-mounted plant tray that was on the front porch – but our plants kept falling off – so it became a feeder. If you wanted to add some other goodies for really cheap, take a plastic plant saucer and tack it to the tree trunk. Heck, you could even offer seed, or water in this fashion! The pale yellow glob is suet, which everybody loves, and it’s simple to make yourself. Some fast and easy recipes are on our site under birding resources. 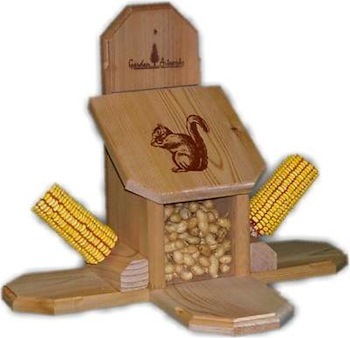 But say you wanted to go all out, and offer a deluxe squirrel feeder for furry friends? Look no further than the Munch Box Combo. 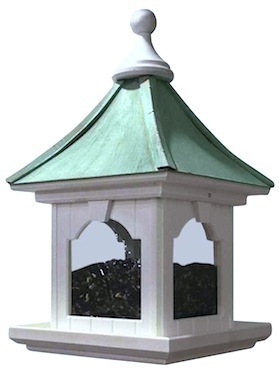 It offers variety in a handcrafted, quality feeder that’s made in the USA. Monday is Penguin Awareness Day! Monday happens to be Penguin Awareness Day, and although they’d never use a cool birdhouse like this, we thought it appropriate to highlight their plight according to the Environmental Defense Fund. They’ve put together a fantastic slide show, worthy of a peek if you have a second, or ever though of penguins as being cute! Some interesting facts about these magnificent birds and their struggle to adapt to a warming climate. The birdhouse won’t help in the least, but the photography in EDF’s presentation is fantastic! 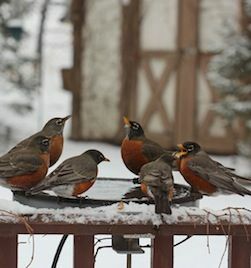 How Would Heated Bird Baths Help Birds Stay Warm? The polar vortex, record low temperatures in the deep South, gripping snow storms that paralyzed many cities… thankfully we’re finally starting to thaw out! This is when creature comforts of home can be most appreciated, especially if you had to spend any length of time outdoors in this frigid weather. Birds and wildlife in general have additional stresses during severe cold as they must expend more energy to find food and shelter. Sure they’ve adapted, and use various methods for coping with high winds and biting cold. The weaker of any species may succumb to starvation or predation, thus the old adage “survival of the fittest”. 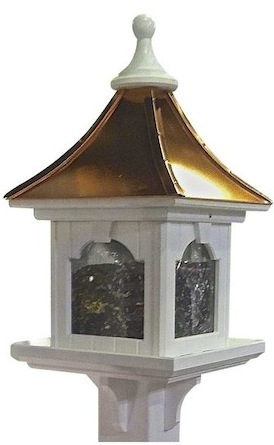 Wild birds will seek shelter in shrubs, dense foliage, natural cavities, even birdhouses and roosts. Some, like bluebirds, will even huddle together for warmth. Many common backyard birds will spend the entire day at bird feeders packing on calories to make it through another night. Peanuts, suet and black oil sunflower provide power-packed meals for most of our feathered friends! Keeping feeders clean and full greatly increases survival rates of resident songbirds during freak weather like last week. But what about water – surely with all that snow out there, birds can get water? Yes, they can, but it costs them dearly. The snow must be converted to water, which takes precious energy, and during single-digit temps, every ounce of energy must be conserved in order to survive. This is when heated bird baths can literally be life savers for some birds since they require water daily. Some baths may even form ice around the edges, but they’ll still leave open water towards the center. Adding a heater to your existing bath is also a great option, or even putting out a shallow pan of warm water several times a day. Hey, if the snow’s that bad you’re probably home from work anyway, right? 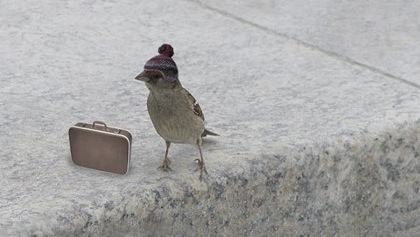 Please help birds through tough winter weather by offering food, water and shelter, their lives depend on it!